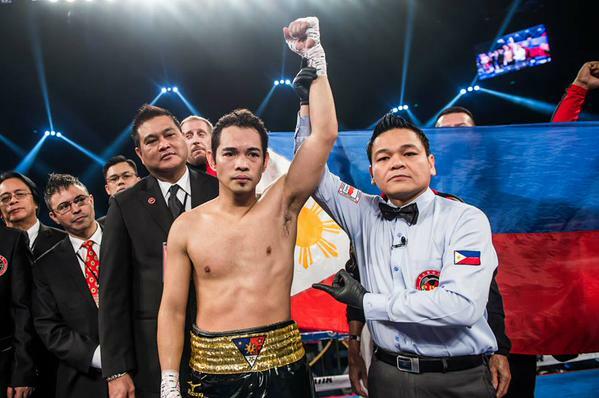 MANILA, Philippines - The 'Filipino Flash' Nonito Donaire Jr. won the match against French man Anthony Settoul after three knockdowns to claim victory and improve record of 35-3 (with 23 wins by knockout) at the Cotai Arena in Macau, China on Saturday, July 18, 2015. Donaire dropped the overmatched Settoul (20-4, 8 KOs) twice in the first round and gave rib-crunching left hook to the body for another knockdown. Time of the stoppage was at the 1:14 mark of the second round. On his Facebook page, the Pinoy pride thanks God and all his supporters. "I want to thank God for keeping me safe and for giving me the tools I needed to win this fight tonight. Thank you to my family, my wife Rachel and 2 sons, Jarel and Logan for being supportive and understanding the sacrifices we had to endure. My father and head trainer for relentlessly working with me in Cebu and Las VEGAS to sharpen my tools. My team Gerry, Bazz, Masa, Singer, Allan and Velasco: you being behind me. My mother in law for helping with my boys and caring for them when I couldn't be there. To ABSCBN, you are family to me and appreciate your belief in me. Top Rank thank you for giving me the opportunity to fight in Macau once again." "To all my friends, family, and fans: your unwavering support is more than I ever imagined. Salamat salamat salamat kaayo at Mabuhay Pilipinas." Here is the video of body shot that dropped Anthony Settoul for the second time in the first round. Bob Arum, who promoted Donaire is thinking of a fight with reigning WBA super-bantamweight champion Scott Quigg, an Englishman, later this year.